Sun Valley Co.s Bald Mountain personnel have worked around the clock since the beginning of November to ensure that Thanksgiving Day skiing is as good as it can be. Snowmaking, from the nozzles and hoses of the worlds largest computerizes snowmaking system, has also continued around-the-clock. Ali Appleton, left, and Kara McNamara took advantage of Baldys man-made snow to do some tubing on Lower Warm Springs Sunday. Sun Valley public relations and marketing representative Kris Nardecchia said conditions on Thanksgiving Day should consist of groomed, man-made snow with 127 skiable acres open. Upper College, Flying Squirrel, Lower Picabo Street, Mid and Lower River Run, Lower Warm Springs, Roundhouse Lane and Kinderplatz ski runs will be open. Additionally, Quarter Dollar ski run on Dollar Mountain will be open. Those are minimums, Nardecchia said. 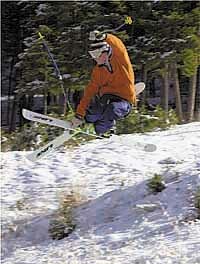 Cory Warren warms up for the coming season by grabbing some air and a ski. Warm Springs, River Run, Lookout, and Dollar Cabin day lodges are scheduled to be open. According to Sun Valleys Internet ski report, the summit snow depth is 35 inches of man-made and natural snow. However, snow depths will vary mountain-wide, the reports states. This fall, approximately 25 inches of natural snow have fallen on Baldys summit. For the past several weeks, local residents, and particularly local youths, have been taking advantage of the steadily growing man-made snow fields to get in some early-season turns. This skier navigates a field of pre-season "death cookies," which will hopefully be groomed into oblivion by the time the season officially opens tomorrow. The skiing promises to be considerably better than last years dismal opening day, when only Lower River Run was available to skiers. Unseasonably warm temperatures and lack of precipitation led to the poor opening conditions last year. This fall, Nardecchia said, Mother Nature has cooperated more than enough. Copyright © 2000 Express Publishing Inc. All Rights reserved. Reproduction in whole or in part in any form or medium without express written permission of Express Publishing Inc. is prohibited.